Wine. Quite possibly the most ancient and complex drink known to humans. How do you know what differentiates the good stuff from the good old two-buck-chuck that’s always on sale? We can’t all be experts, but we can at least be knowledgeable about the basics when it comes to wine. It’s not always about the brand of wine or how much it costs either. There are some pretty good bottles out there that are decently priced and taste better than stuff that costs $100 a bottle. And the holidays may be over, but when there’s a party there’s booze. What kind of booze? Well, that’s the million dollar question, now isn’t it? Every wine has it’s outstanding elements, and they all have their prime qualities to look for. And certain wines are going to be better suited to different circumstances. Cocktail parties, for example, might call for a variety of fun vibrant flavors. Or if you’re on the hunt for a good wine keg for the office then you’re going to want to invest in a standard wine that all your employees will enjoy. From the everyday office to the random party to the picnic in the park. Learn how to choose the right wine for the right occasion. Is food involved? If so how? Certain wines pair well with some foods and not at all with others. 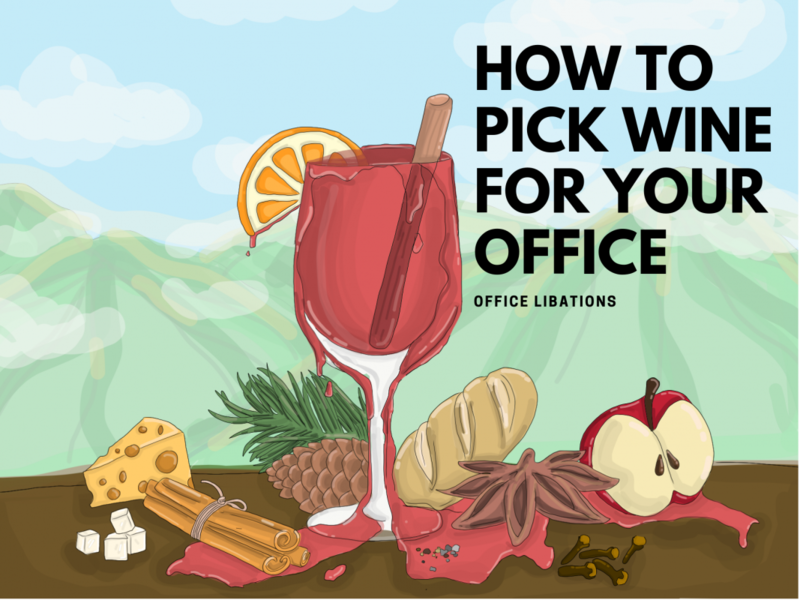 If you’re looking for good wine in the workplace, then you’re going to want to look for a simple wine that can pair well with just about anybody’s lunch choice. Or if you’re in charge of the party planning, then find a variety of wines that pair well with the food options at the event. There’s a definite science behind food and wine pairings. A very extensive science that can be best explained in our earlier post on The ABC’s of Wine. There are some go-to rules that we’ll get into later, but for now, just remember that food and wine pairings also have a lot to do with personal taste as well. What’s the reason for buying wine? In other words, what’s the occasion? If you’re looking for a celebratory drink then Champagne or sparkling wines would be your best bet. Or if it’s a fine Gala that you’re planning on hosting then a bold red wine will definitely impress your guests. Easy going get-togethers and summer gatherings are best suited for fruitier, more refreshing options like a light Rose. Or you’re looking for a steady everyday kind of wine then a red blend wine keg is an ideal option. There’s plenty of different routes you can go here, and feel free to stray away from the conventional. Take into account the people you are catering. Statistically, you can never go wrong ordering a keg of red wine for a party or for the office. According to a survey done by the Wine Market Council, 42% of the US population consumes red wine over any other style of wine. This is followed closely by white wine and Rose with 33% and 11% of the population consuming these styles. A mixture between a Cabernet Franc and a Sauvignon Blanc, a Cabernet Sauvignon is considered one of the more bolder wines on the spectrum. Some of the best Cabernet Sauvignon wines come from our local Napa and Sonoma areas. They’re full of rich flavors and leave you with a long and lasting finish. It can be a little overwhelming by itself so it’s best to drink this with a hearty meal. So there are two distinct styles of chardonnay. There’s the oak aged style and the non-oak aged style. The oak-aged style tends to be richer and creamier in taste while the style not aged in oak tends to be crisper with more mineral flavors. Because of this, some Chardonnay varieties can be radically different from others. For the most part, though, there are some standard features. One word commonly associated with a Pinot Noir is ‘earthy.’ This is because it’s not a very fruit forward wine. This grape varietal is very difficult to grow well, thus it’s a very difficult wine to perfect. But when it’s done nearly to perfection, the result is absolutely outstanding. The best way to describe a Sauvignon Blanc is ‘crisp.’ Between Chardonnay and Sauvignon Blanc, Sauvignon Blanc definitely packs a punch to the taste palate. It’s vibrant flavors and crispness make this the perfect refresher to any day. Enjoy it alone or pair it with the perfect meal if you want to get the most out of this wine. So not the most popular among wine snobs. But Merlot is still a prime pick for any dinner party or office get together. The funny thing is that Merlot and Cabernet Sauvignon are very similar since they’re both derived from the same grape: Cabernet Franc. So you might notice subtle nuances that remind you of one or the other. Regardless of origin, the smooth finish and lasting mouthfeel make Merlot an ideal pick for any occasion and anyone. Like Chardonnay, there are two types of Zinfandel. There’s the Rose type of Zinfandel that we like to call ‘White Zinfandel’ and then you have your traditional red Zinfandel. A white Zinfandel is a perfect wine for beginners. If you’ve tried a White Zinfandel, you’ll know that these guys are low in alcohol, and perfectly sweet. With a red Zinfandel, you’ll get more complex flavors and a bolder style. The biggest give away is its color. With a Malbec wine, you’ll notice its deep purple-red color right away. It’s full-bodied flavor and fruit notes bring out the best in this one. As Argentina’s signature grape varietal, go ahead and try the full-bodied flavor of a Malbec for yourself. Choosing the right wine is not an easy tasking. If anything, it can be pretty intimidating, especially if you have no clue where to start. We’ll admit, it’s a daunting task made even more difficult by the endless list of factors to consider when making a decision. Food pairings, alcohol levels, and flavor profiles, and occasions are all variables to consider. So while you’re sitting there trying not to tear out your hair over having to decide on options, keep one thing in mind. The rules for choosing the best wine, whether it’s a wine keg for the office or a party, are not set in stone. Wine is a completely subjective matter. What baseball is to Americans, wine is to the French. Think of it as a pastime. The best qualities in wine are brought out by good food, good people, and good times. Is Boxed Wine Really As Bad As You Think It Is?